This quote by Eric Jensen says it all. When I took his 6-Day Teaching With The Brain In Mind training this was one of the posters on the wall. We learned that you cannot separate thinking and emotion. And when you plan to tie emotion to your content or learning experience the memory is more likely to stay and be recalled at a later date. Given this information, as educations wouldn't it make sense to work very hard to plan for positive emotions as we create learning experiences for our students? And as teachers who don't see students every day (some of use once or twice each week) don't we want them leaving us with positive emotions linked to our content and to us as teachers? I have always had students reflect in some way at the end of class. 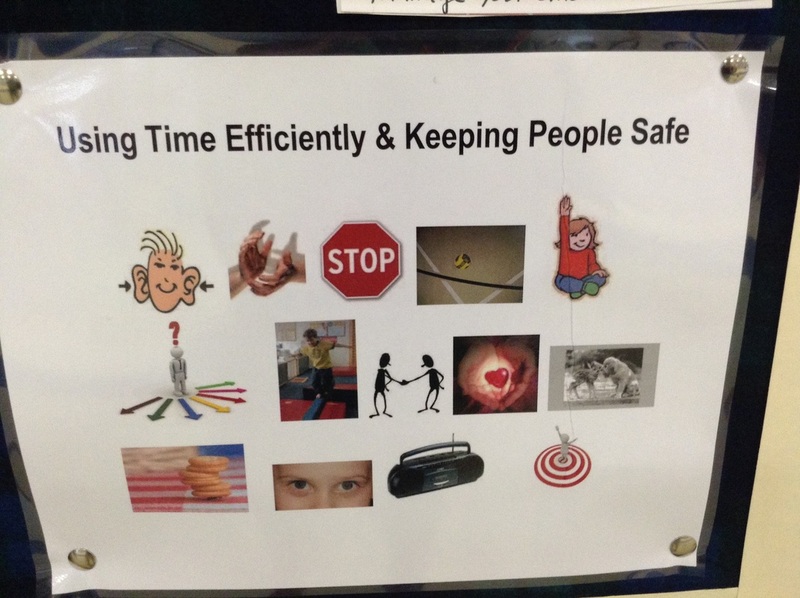 One of my favorite tools to use with younger students is a page full of images that represent the positive choices and behaviors students have as they learn to use class time efficiently and keep people safe. It's simple and has no words. There are many different ways that this can be used and I have developed a progression that I use with Kindergarten, first and second grade students. The focus of this quick little activity at the end of class is to have students identify and reflect on a strength or positive choice they made during class. Pictured below is the reflection tool I am currently using. Kindergarten - At the end of the lesson I say the word "Reflect" and offer my Kindergarten students a choice as to whether they would like to visit the reflection board first or go get their drink so they can have a bit of time to think about what they are going to choose. At the beginning of the year as they come up to the board individually, pick up the pointer and choose an image, I tell them something I noticed them doing during class that either supports using class time efficiently or keeping people safe. I say, "I noticed that you _________ today. Is that what you were thinking?" They always agree... By doing this I am filling their heads with positive thoughts about themselves and at the same time reinforcing positive choices. After about 4-5 weeks of this I move to offering them a choice as to whether they would like me to tell them what I noticed or would they like to share something that they are thinking. They leave me with positive thoughts and a positive interaction. When they are leaving you and headed off, not to see you for a day or so is not the time to address the negative. If how they are feeling is going to be linked to you and physical education, don't we want it to be positive?